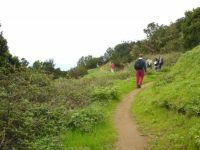 La Gomera has more than 500km of signposted trails, although on this website there are 720km of registered trails. There used to be many more roads, but there were no roads and roads were the only means of communication. Many of them have disappeared with the rains and abandonment. However, the interest generated by the boom in naturalization and sport tourism has led to the rescue of this heritage of our ancestors by the Cabildo Insular de La Gomera. This heritage is conceived as a very dense mesh of trails that make it possible to design circular routes for the majority of visitors to the island who use a rental car, but also linear to promote the use of bus lines (guaguas) or move from one accommodation to another in the framework of an itinerant hiking, although La Gomera has very few shelters. Guaguas schedules and the possibility of seeing their routes on maps, help a lot in designing routes without cars. The old paths were used to access the cultivation areas and to link villages and hamlets. The so-called "Caminos reales" were the main paths that united the villages, resembling the national roads. Many roads deserted crop areas or were shortcuts that shortened the main road called the "Beast Path". The short cut often did not allow the passage of donkeys, mules or horses. However, on the "Beast path" there were charged animals passing through. Nowadays, goods go along asphalted roads, but there has been a tremendous demand for signposted and passable paths by the dominant tourism on the island of La Gomera. This nature tourism is fond of hiking and sport, it wants to access the most beautiful panoramas of the island, which is not possible by asphalted road. A physical level to reach all visitors. Most walkers use a rental car. Others want to go around the island. To know the different aspects of the island of La Gomera in its 4 dimensions. There are emblematic places that must be part of any program. A respect for nature and sustainability, while following the rules of Garajonay National Park. By selecting the sections of the map to build your route, you can control the gradient and distance of the trail as you add the sections. At the end you can recover the kml or gpx file for use on a mobile phone or gps to help you on the road (for androids you can use the free GPXViewer application). Some hiking routes come as "Recommended Routes": they are the most emblematic and well-known. They are grouped according to distance and level criteria.